Reinforced mattress Edges and is of 34㎝ thick. 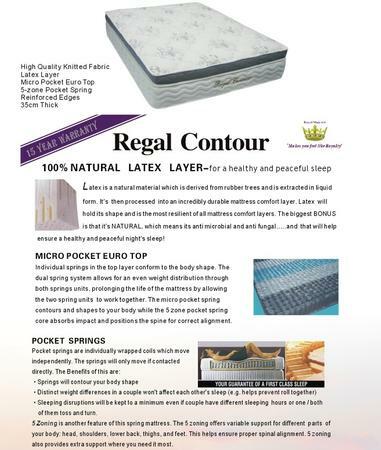 The Regal contour mattress has a 100% NATURAL LATEX LAYER-for a healthy and peaceful sleep offers optimal support and provides excellent air flow. As well as a supportive sleep surface. It is durable, naturally anti dust mite and anti bacterial. Individual spring in the top layer conform to the body shape. The dual spring system allows for an even weight distribution through both spring units, prolonging the life of the mattress by allowing the two spring units to work together .The micro pocket spring contours and shapes to your body while the 5 zone pocket spring core absorbs impact and positions the spine for correct alignment. - Sleeping disruptions will be kept to a minimum even if couple has different sleeping hours or one/both of them toss and turn.5 Zoning is another feature of this pocket spring mattress. The 5 zoning offers variable support for different parts of your body: head, shoulders, lower back, things, and feet. This helps ensure proper spinal alignment. 5 Zoning also provides extra support where you need it most. Our company is passionate about building a quality product, our standards are high, and this is reflected in the beautiful range of bedroom settings and custom made pieces.